Sound Forge Pro 10 software efficiently and reliably provides audio editors and producers complete control over all aspects of audio editing and mastering. Whether in the studio or field, it's the ultimate all-in-one production suite for professional audio recording and mastering, sound design, audio restoration, and Red Book CD creation. 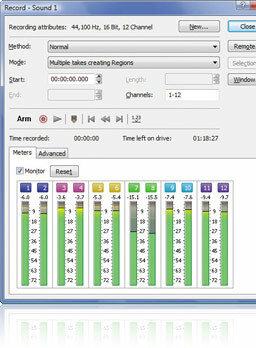 New features in Sound Forge Pro 10 include precise event-based editing, integrated disc-at-once CD burning. Sound Forge Pro 10 provide all aspects of audio editing and mastering. Sound Forge Pro 10 software supports full resolution 24-bit and 32-bit/64-bit float 192 kHz files for the ultimate in audio fidelity. Capture the subtle overtones and nuances of instruments, vocals, and effect changes. Additionally, Sound Forge Pro 10 software includes industry-leading iZotope MBIT+ Dither (bit-depth conversion) and 64-Bit SR (sample rate conversion) for the highest in audio quality. Qweas is providing links to Sound Forge Pro 10.0.491 as a courtesy, and makes no representations regarding Sound Forge Pro or any other applications or any information related thereto. Any questions, complaints or claims regarding this application Sound Forge Pro 10.0.491 must be directed to the appropriate software vendor. You may click the publisher link of Sound Forge Pro on the top of this page to get more details about the vendor.